Fishing with cormorants, Gifu, c. 1930. 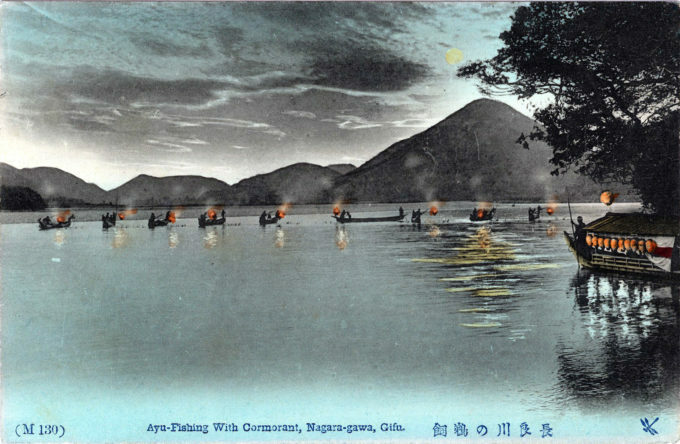 “Ayu-fishing by cormorants”, Nagaragawa, Gifu, c. 1930. The cormorant is employed usually at night, after the moon has set. 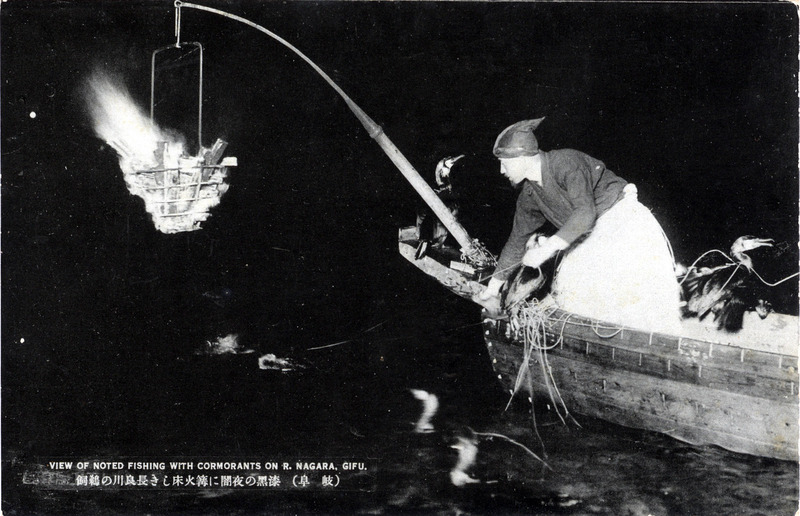 Each boat, lit with torches, has a cormorant handler, an assistant and two rowers. “Cormorant fishing is generally done by a party of fishermen making up a series of boats, with four men to each boat. The chief or leader of each stations himself in the bow, and has under his management at least twelve birds, and sometimes as many as eighteen. The way he and his feathered helpers ply their trade is what has given this locality its wide spread reputation for this peculiar employment. This man is distinguished by his hat from a second fisherman in the boat, who handles four birds. A third person, seated in the stern, tends strictly to navigating the boat, while the fourth, seated in the forepart, keeps up an incessant noise by striking bamboo sticks together, and in shouting to encourage the birds. He is called kako, and is quite as indispensable as the others. “Each cormorant has had a metal ring placed around its neck, fitting close enough to prevent it from swallowing the larger fish, and sufficiently loose to allow the small ones to pass down its throat. A sort of harness is rigged about the body, to lower and lift the cormorant at the will of its master. This contrivance is somewhat after the style of a shawl-strap, a piece of whalebone answering for the handle on its back, while a stout cord is fastened to this to keep the bird from straying too far, and to guide its movements. This is made of spruce fibre, and is usually about a dozen feet in length. “The details carefully arranged, the steersman allows the boat to drift down the river, its course lighted by rows of torches on each side, for cormorant fishing is always done at night. Upon reaching the fishing- ground the master lowers one after another of his birds into the water; and when the entire lot has been let down, he gathers the reins in his left hand, keeping his right for the recapture of the cormorant and removal of fish as often as the occasion demands. He in control of the four birds follows the example of the leader, and the sport opens in earnest. The fish are attracted toward the boat by the torchlights, and the birds begin to gorge themselves with members of the finny tribe. The creatures that seemed so clumsy on land dart hither and thither with astonishing swiftness, diving whenever they catch sight of a fish. 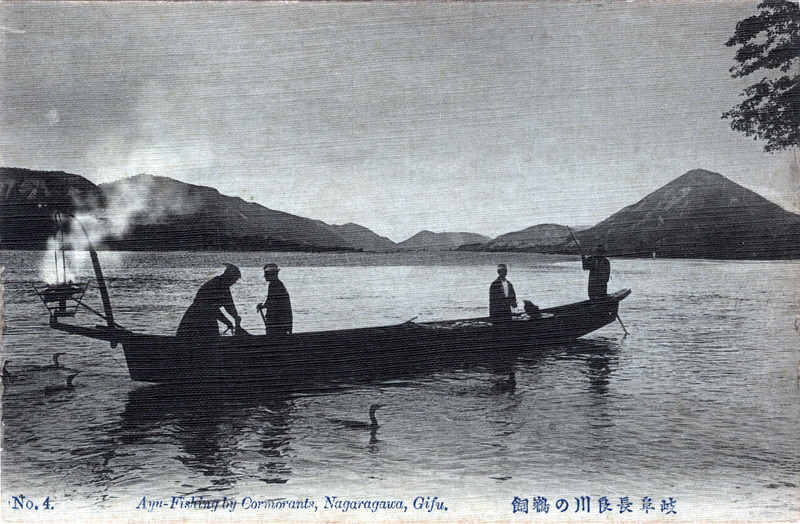 Cormorant fishing, Nagara-gawa, Gifu, c. 1910.